For the month of April I have decided to bake a pie a week, so consider this the first of four Friday Pie Days. In an effort not to have April also be the month I gain 50 lbs, I will be giving away all of these pies. If you are within pie-getting distance of me, please let me know if I should put you on the list. 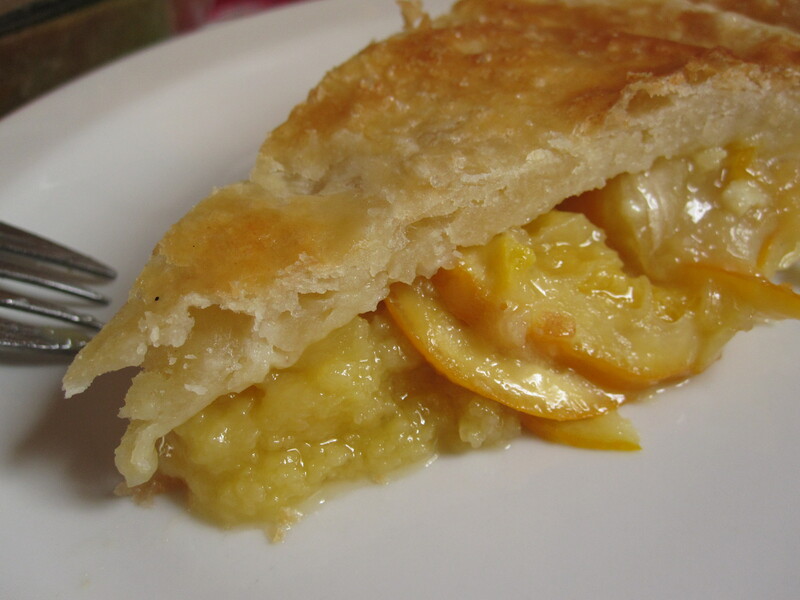 This pie is a delightful taste of Spring. 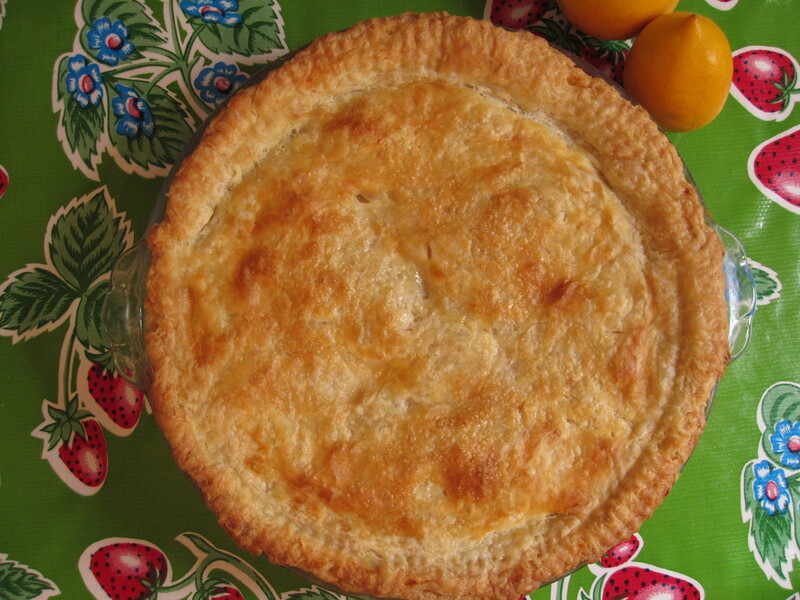 Meyer lemons are in themselves a treat, and when paired with the simple ingredients of sugar, egg, and vanilla, all poured together in a flaky buttery crust, what you have is a pie that is reminiscent of lemonade stands and sunny afternoons. That’s basically all that needs to be said about this simple, sweet little pie so I’ll now take this opportunity to wish everyone a wonderful weekend, full of sunshine and baked goods! Thinly slice the lemons – as shaved thin as you can get them. Use a mandoline if you have one. I don’t have one and a sharp knife worked fine, but go slowly! Pick out any seeds. Toss with the sugar and salt and set aside. Heat oven to 450°F. Grease a 9″ pie dish or tart pan. Roll out half the dough into a circle. Fold dough in half and half again, careful not to let it tear (and use flour if it start to stick). Press point into center of pie dish, gently unfold, and carefully press the dough into the pan. Using a knife or shears (or your hands), trim away the extra dough so that there is a half inch of dough hanging over the pan. Tuck under and roll this extra dough, and pinch tight to the side of the pan. Put in the freezer to chill. Roll out the rest of the dough, gently fold in half twice(as before) and put in the freezer to chill. Beat the eggs well and stir into the lemons with the vanilla. Remove the chilled pie crust from the freezer and pour in the lemons. My filling was pretty watery so I added some flour to thicken it a bit. Place the other round on top and trim to fit. Pinch seal the edges and cut a few slits on the top to let out steam. Brush with egg white or milk and sprinkle a thin layer of sugar on top. Put back in the freezer for 15 minutes to chill. Take out pie and bake on the lowest rack for 15 minutes at 450°F. Turn the heat down to 375°F and move to the center rack. Bake for another 30 minutes or until the crust is golden. If the crust edges begin browning too much cover with parchment. Let cool for at least half an hour before eating. Serve with vanilla ice cream or whipped cream if you like. 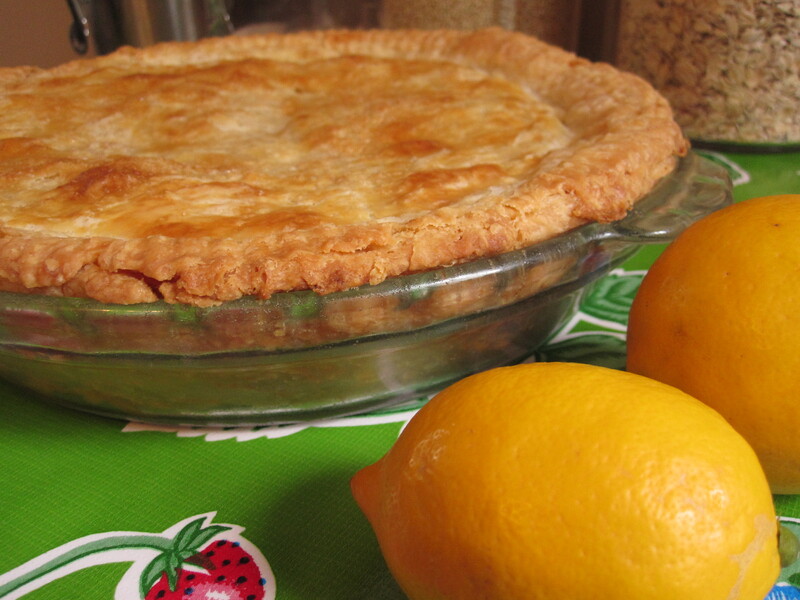 This entry was posted in Pie and tagged friday pie day, lemon, meyer lemon, pie. Bookmark the permalink.